Last Updated: April 17, 2019 · Published: September 11, 2017 By: Asian Caucasian 1 Comment This post may contain affiliate links or sponsored content. Ninety minutes to make a fantastic Korean dish? Heck, yeah! 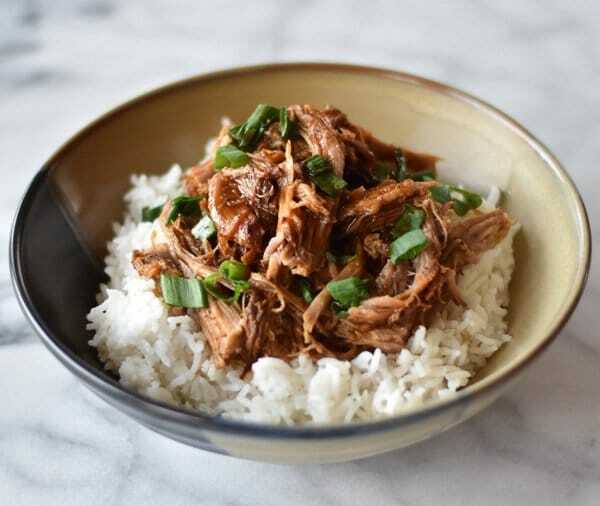 This Korean-inspired pulled pork recipe is a sticky, slightly spicy, flavorful take on pulled pork, made fast in your Instant Pot pressure cooker! We borrowed this recipe from Lane Patten with the awesome food blog, With Two Spoons. You can just smell the aromas wafting through your kitchen from the wonderful Korean flavors like gochujang sauce, garlic and ginger, sesame oil, and other seasonings. Lane uses boneless pork shoulder that literally falls apart once cooked in the slow cooker. Top it with a poached egg, so pretty! Makes a quick meal for those busy weeks now that school’s back in session! Enjoy, and thank you Lane! The pork shoulder literally falls apart once cooked in the pressure cooker! So tender and flavorful, serve this dish over sticky rice for the perfect and quick meal for your family. 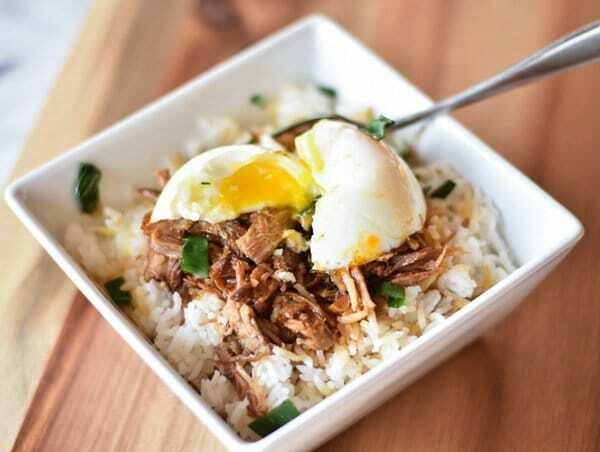 A poached egg is so pretty on top of this delicious Korean-inspired pulled pork recipe. Everything tastes good with an egg on top! 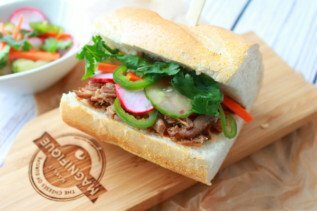 One bite of this tender Korean pulled pork and you’ll go for seconds, and thirds! In a medium-sized bowl combine garlic, water, soy sauce, gochujang sauce, brown sugar, rice vinegar, sesame oil, lime zest, lime juice and grated ginger to make a sauce. Press sauté button on the Instant Pot. Place pork into the Instant Pot and sear, turning pork every 2 minutes. 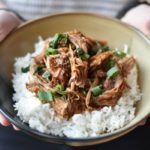 Pour sauce over the pork in the Instant Pot. Press the manual button on the Instant Pot. Adjust time to 45 minutes. Press the start button and the Instant Pot will start coming to pressure (Will take approximately 10 minutes to get to pressure, and then will start a count down). When the Instant Pot beeps (after the 45 minutes have counted down), allow natural pressure release (this will go faster if you turn the Instant Pot off, but this is not necessary). Natural pressure release will take approximately 30 minutes. 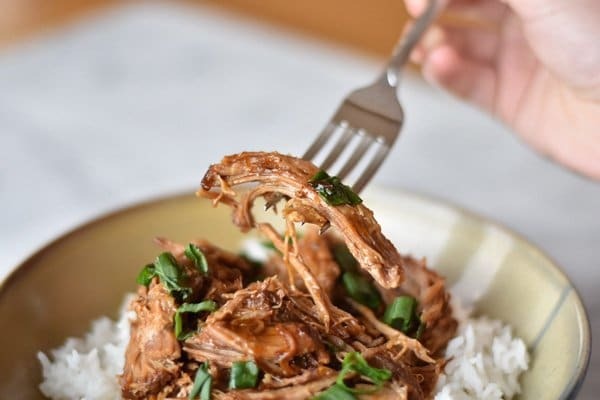 Remove pork from the Instant pot and pull with two forks. Add a few tablespoons of sauce to keep pork moist. Press sauté button on Instant Pot. Reduce the sauce to desired thickness (I prefer my sauce thin so it soaks into the rice, but if you prefer your sauce thicker, combine 2 tablespoons of cornstarch with 2 tablespoons of water to make a slurry, and then add to sauce while reducing.) Serve pork over rice and drizzle with sauce. Garnish with options listed above! True confession time – I own a pressure cooker and I’ve never used it. What in the what is wrong with me! This recipe gives me the perfect excuse to use it because your recipe looks mouth watering!